The Astrolabe (Greek: ἀστρολάβος astrolabos, from astron (star) and lambanein (to take), i.e. star-taker) is a sophisticated inclinometer, used in the past by astronomers, astrologers, and navigators, mainly for locating and predicting the positions of the Sun, Moon, planets, and stars, determining local time given local latitude and vice versa, for triangulation, and surveying. Astrolabe was actually an analog calculator, that measures the altitude of stars and planets above the horizon, capable of working out several different kinds of problems in spherical astronomy. It is unknown who and when devised the first instrument we know today as the astrolabe. Some historians attribute the invention to Hypatia of Alexandria (c. 360–415), mentioning that Synesius of Cyrene (378-430), a student of Hypatia, credits her for the invention in his letters and he apparently had an instrument constructed that was arguably a form of astrolabe. Hypatia's father, Theon of Alexandria, wrote a treatise on the astrolabe about 390 AD that was the basis for much that was written on the subject in the Middle Ages. But it seems the theory of the astrolabe had been established many centuries before Theon and Hypatia. 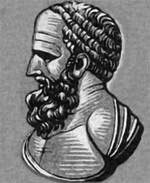 Apollonius of Perga (262 BC-190 BC), the great codifier of conic sections, probably studied the astrolabe projection about 225 BC. Apollonius was a Greek geometer and astronomer, whose innovative methodology and terminology, influenced many later scholars including Ptolemy, Johannes Kepler, Isaac Newton, and René Descartes. Apollonius gave the ellipse, the parabola, and the hyperbola their modern names. The most influential individual on the theory of the astrolabe projection was the Greek astronomer, geographer, and mathematician Hipparchus of Nicaea (190 BC-120 BC). He is considered the founder of trigonometry and the greatest ancient astronomical observer. It is believed, that with an astrolabe Hipparchus was the first to be able to measure the geographical latitude and time by observing fixed stars. Previously this was done at daytime by measuring the shadow cast by a gnomon, by recording the length of the longest day of the year or with the portable instrument known as a scaphe. 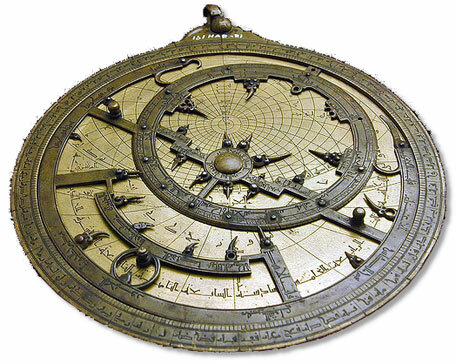 The earliest descriptions of actual astrolabes were written by John Philoponos of Alexandria (c. 490–c. 570) in the sixth century. There were two basic types of astrolabes. The first type, known as a planispheric astrolabe, helped astronomers calculate the positions of celestial objects. All early astrolabes were of the planispheric sort until seafaring folks saw how useful the instruments could be. Sometimes in the 15th century, maritime astrolabes began appearing, a version of their planispheric cousins, used primarily to determine the altitude of the sun or a star, which could then be used to determine latitude. They came with two basic parts: a graduated circle and an alidade, a sighting device or pointer used to measure angles. Planispheric astrolabes were a bit more complicated and were also more idiosyncratic because their operation depended on the user's latitude. The astrolabe was in use until the last half of the 17th century. The invention of the pendulum clock made clocks much more reliable, and more specialized and accurate scientific devices, such as the telescope, became available.